Many high schools, both public and private, offer advance placement (AP) and dual-credit courses to qualified students. This allows talented students to take rigorous coursework and possibly earn a limited number of college credits. Some states even allow high school juniors and seniors to attend courses at local colleges while in high school – earning transcripted college credit together with high school credit. These programs can contribute to accelerated learning, but at the sacrifice of traditional high school social interaction. NCA offers an intimate, guided setting for true accelerated learning. Students live, study and explore with equally talented and committed peers, gaining life-long friends and confidence in their abilities, while earning a full two years of college credit upon successful graduation. NCA is located in Ladysmith, Wisconsin, a rural town of less than four thousand people surrounded by the recreational paradise of northern Wisconsin forests, rivers and lakes. Ladysmith is a small, caring community with very low crime, yet full of the services and amenities of larger cities. As the county seat of Rusk county, Ladysmith has a vibrant local school district, the county sheriff’s department, a variety of stores and restaurants, and within a quarter mile of the NCA campus, a modern hospital and hotels. On campus, NCA employs a security system and nursing staff, monitors all building entrances, and requires registration of campus visitors. In addition, NCA adheres to strict regulations involving student travel, off campus activities, visitor access to campus facilities, and nighttime curfew. Time: The NCA model allows a student to obtain a Bachelors degree within two years of high school graduation, and a Masters degree within four years. Plus, all NCA graduates who have successfully completed the AA degree are readily transferred into any UW system school. Degree credits are also transferable to other colleges and universities. Money: The savings realized by accelerating a degree completion can be substantial. For a student who would otherwise be attending another resident prep academy, the savings in university tuition and fees can top $80,000. 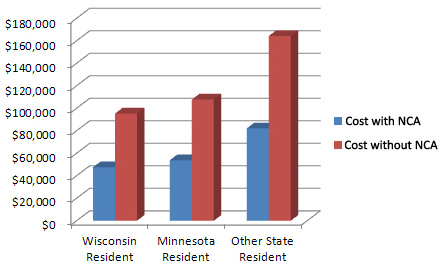 The chart to the right shows examples of the cost savings a NCA graduate would realize if they were to attend a University of Wisconsin system college. High standards are communicated during the application process, as NCA will engage students in rigorous, in-depth academic work requiring intellectual inquiry, creativity, and critical thinking. While NCA is best suited for students who seek the challenge of rigorous curricula and college-level study, the NCA model is equally focused on developing outstanding young men and women committed to personal excellence, community involvement and global awareness. As a private high school, NCA strives to reflect national and international diversity. NCA students will be living and learning with equally committed students from around the world, developing lifelong friendships, and working as a team to solve problems. NCA is about reaching your potential, and helping others reach theirs.